Grilling season is approaching, and one of my favorite summer sides is this red rice from Saipan. As I mentioned in my post on Chicken Kelaguen, this is a common island dish that brings back fond memories of the local cookouts and celebrations. The red coloring comes from soaking achiote seeds in water. The seeds are a source of annatto, a natural pigment used in many types of foods, including cheeses, fish, and oils. In fact when shopping for these seeds, you may find them labeled as either achiote or annatto. The seeds themselves provide almost no flavor, so the flavor in this dish mostly comes from the addition of bacon and onion which gives the rice a richness that goes well with grilled chicken and fish. Soak the achiote seeds in water for about 30 minutes, until the liquid is a dark rich red. Drain the seeds, reserving the liquid. 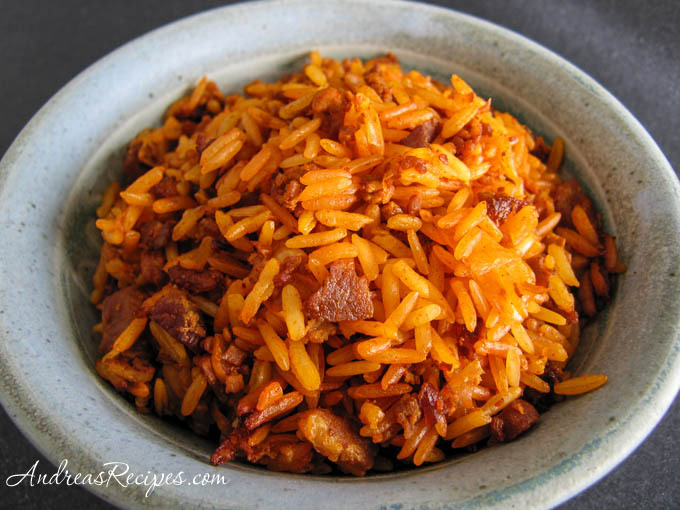 Put rice, bacon, and onion in the pot and add the achiote liquid. Bring the rice to a boil and then allow it to boil down until the liquid is almost completely gone, about 15 to 20 minutes. Cover and reduce heat to low, and simmer for 15 minutes. Stir and serve. You can find achiote seeds in the international foods aisle of well-stocked grocery stores.